XBMC and Boxee Now Run on Apple TV! I got an email today from Team XBMC about the beta 2 release of Atlantis which is their first cross platform version which now runs on Xbox, Linux, Windows and OS X. 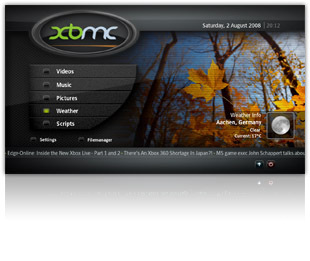 First off, if you’re not familiar with XBMC it is by far the best Media Center front end software period. I’ve been using it on my Xbox for years, have looked at other software and nothing comes close. The only problem for me is that the Xbox is starting to show it’s age and I want to replace it. The unit is big, loud and some of the HD resolution videos are now too much for the Intel Celeron 700MHz processor to handle. With that said, I’ve been hoping for XBMC to become available for an existing appliance in my home theater. I currently have a Playstation 3 which I feel does a terrible job as a media streamer. The interface is poor, performance is very lacking when streaming from my PC using Tversity whereby FF or rewinding video is jumpy, even on a wired Gigabit connection. I’m also considering getting an XBOX 360 which I hear does a better job. But either way my dream would be to run XBMC on either of these systems. I was also considering putting together a small footprint mini PC or Mac mini to run XBMC but really don’t want to introduce a computer to my home theater and it’s a pricy option just to run XBMC. So today I was really happy to hear that they got the latest version of XBMC to run on an Apple TV. I didn’t know much about the Apple TV so I wanted to do a little research about its specs to see if it was a viable option to run XBMC. I came across this site which states it uses a 1 GHz Pentium M Crofton Processor based on the Pentium III design. That has me a little worried as to whether it can handle HD videos using the newer codecs. Digging in a little deeper I also found out that the Apple TV has a max resolution of 720p or 1280×720. That also is a bit of a negative for me since I’d like the ability to play 1080p content. Lastly the Apple TV only has 100Mbps Ethernet connection whereas most other devices such as the Xbox 360 and Playstation 3 have Gigabit Ethernet. All of that being said I’m still considering getting an Apple TV for XBMC as it’s still probably a worthy replacement for the Xbox and at a price of $229 it’s priced pretty well. There was also another interesting development I came across in that the Apple TV can also now run Boxee. This is another software project that is based on XBMC but adds a social component by sharing your listening and viewing history with friends. I’m really excited about the possiblity of Boxee providing a great new source for my Lifestream. I am looking forward to seeing some Apple TV owners post reviews of their experience running XBMC or Boxee on it. My biggest issue is the fact that video quality is poor, but that is an iTunes issue, not AppleTV. I'd have to expect Apple to address this issue by making HD video content available soon. Apple has introduce new Apple TV and it's really a very nice gadgets, I loved it..
Amazing stuff,Thanks so much for this!This really is very helpful post for me. This will absolutely going to assist me in my projects .